Over this past Labor Day weekend, my 3880 students were asked to take the What 90’s Toy Are You? Quiz, a pre-writring activity to prompt thinking about their technological histories–a catalyst for constructing personal narratives that story experiences with old media, new, and new new media. I took the quiz and got this result: Magic, The Gathering. As a high school and college student during most of the 90’s, I wasn’t much into toys anymore, and I had never even heard of MTG. So I wikipedia’ed it, thought it looked like the kind of role-playing fantasy crap I would never play and Googled a What 80’s Toy Are You? Quiz to get a more meaningful result. And here it is. Alphie–my first battery-operated smart friend. To give you a little perspective, I am an only child and was the only grandchild in our family for nearly a decade. My dad, aka Golden Arm, was a Local 45 welder & pipefitter who could, he quipped, close the crack of dawn or mend a broken heart. But seeing as North Carolina had (and has still) no love for the union, and he wasn’t about to scab locally on a non-union job, he was always working, as my mom would say, “up the road”. My mom was a house-wife, and while my political correctness wants to assert itself in that designation, it just wouldn’t be right. Her primary responsibility was, and still is, I think, to my dad. No matter how much she read to me, which she did– a lot– or how much she helped me learn my letters, numbers, colors, it was never enough. I never got tired of learning new things and in the age of “media by appointment”, before VCRs and DVR’s, I couldn’t get my fill of Sesame Street and The Electric Company. Then and now, movies and television don’t hold my attention unless they require active cognitive participation, and unless I am learning or figuring something out, I’m really not entertained. So my affection for dear Alphie is not all that surprising. As long as mom had batteries on hand (which she did and still does keep a plastic bin full of them in the kitchen under the bar), I had a constant companion who could teach me to count, add, subtract, and match. While practicing those math skills was fun, even then I preferred the language cards and never tired of using my little robot to help me recognize and shuffle letters, listen to letter sounds, and enjoy computer-generated rhymes. 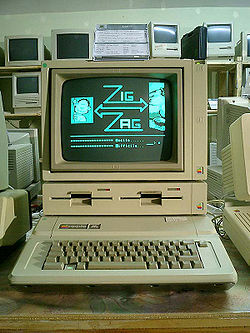 Fast forward to 1984–dad bought a little Apple IIe for me up the road. I remember typing in intricate command line prompts to make the turtle cursor draw simple geometric shapes. It was a solitary activity, and I soon bored of the repetitiveness and detail-oriented importance of each individual character, as I do now when I play around with html code. I remember lots of unfinished rectangles and intersecting lines that should have had a point. Sometime later, my mother picked up a disk for my computer that would allow me to do more with this machine, and if there was any doubt of my future career, The Grammar Examiner erased it. Suddenly I could play as editor of a major newspaper, checking copy for errors in punctuation, capitalization, subject/verb agreement, and adverb and adjective usage (among other indiscretionary uses of language, I’m sure). I was in 2nd grade, but according to the Grammar Examiner’s assessment, I had a college-level command of standard usage and grammar. Soon, when we could afford it, other software followed that allowed me to create in addition to edit. I produced family and neighborhood newsletters when I was in the 3rd and 4th grades and even used my computer to create propaganda for my anti-smoking campaign that threatened to relegate my Uncle Bill and his cigarettes to the patio during my mother’s annual Christmas Eve party. Sometime in middle and high school, my computer dinosaur was moved into special collections, as my boom box and a whole host of Madonna tapes became the focus of my attention. As a pharmacy technician at Mast Drug and Drugco in Roanoke Rapids and later Rocky Mount, I transferred doctors’ scrawl on the paper script to a digital form and printed out legible and informative labels and patient information leaflets to help our customers more knowingly manage their medications and their health. It was just a way to make a dollar. As an undergrad, I used my Brother Word Processor to type essays, usually the night before they were due, but I had no particular interest in computers until my boyfriend got an AOL disk in the mail. Then there was that awful sound, you know the one the one I’m referring to, that dial-up modem cacophony that built in anticipation until the dialogue box flashed “You’re Connected!” and we were surfing the World Wide Web, at 56 kilobytes per second. This new media was exciting. We could email our professors and our cousins, we could throw out the phone book and the huge set of Encyclopedia Britanicas that my dad had also gotten “up the road”, and we coul play the dot com game until the wee hours of the morning, trying to stump the Internet by finding a dirty domain name that hadn’t yet been reserved. The web was ever-present in our lives as a way to research, learn and reach-out, but since I wasn’t a coder, I couldn’t own it. It’s starting to a little bit of sense to me now, though. I have a long history of using computers, primarily for two reasons: to learn and to fill the void of loneliness. In the past few years, in a zen-like convergence, I have blended these two pursuits and sought out or sought to create digital networks of people who, like Alphie, I can learn from and keep me company. After dinner is done, the babies are asleep, and the essays are responded to and class activities planned for the next day, these professional networks are there for me, and I’m pretty satisfied with my computer-mediated life, digitally rendered out of the desire to know and to connect. Tags: aphie, Computers and Writing, Digital Learning | Permalink.